Rural western north carolina offers a lot to love: vast stretches of farm fields, round cows nibbling grass under bright skies, and winding country roads. Then there are the farmhouses. Some barely stand, weathered and worn, with their porches upheavals of rotten boards. Others are more like the spring crops that surround them, tended and cultivated. It was all to be expected of a home constructed in the 1880s. Frank Whisnant, the original owner, passed it and hundreds of acres down for generations, until the family decided to sell in 1986. Around the same time, Dean was in Pennsylvania contemplating a move. He pulled out an encyclopedia, thumbed through it, and picked Western North Carolina as his destination. He soon found the farmstead listed in a real estate magazine. It was the old house Dean had in mind: rough and tumble and full of potential. The interior walls had never been painted, the ceilings were unusually tall, there was just one bathroom, and it came with a collection of outbuildings—including a root cellar and smokehouse—scattered across 25 acres. Dean bought the property and moved in with his children and then wife, and the remodeling attempts began. It wasn’t until years later, when he met Lynn and the two became personal and professional partners, that the effort stuck. She spent 20 years working as a designer and merchandiser for the furniture industry in Hickory. First tries, including pink walls and blue linoleum, are now gone. Today, the home is an imaginative blend of the couple’s talents, filled with a quirky mix of industrial-inspired finishes, folk art, and warm colors and textiles. In the kitchen area, which is part of the great room, heavy iron-legged bar stools (as in 52 pounds each) topped with smooth-as-silk wood seats crafted by Roger Carter surround a large island. Above it hangs a hand-forged steel and copper light fixture by Dean. His craftsmanship is also highlighted in the copper sheeting stretched like fabric across kitchen countertops. A folk-art rocking chair by Winston-Salem artist Sam “The Dot Man” McMillan brings a splash of color. In the living area, baskets of stadium blankets rest near the foot of white linen and leather chairs. “You want a room to be a feast for your eyes,” explains Dean. The mixture creates a surprising and creative space. Dean’s metalwork details, from the cabinet hardware in the kitchen to the half-circle bedside tables in the bedroom, blend with Lynn’s layered textures, vibrant color selections, and interesting objects. In the living room, a box turtle shell tops a stack of books about chair design and Coco Chanel. Built-in bookshelves are filled with collected items and keepsakes, from face jug pottery to horseshoes. “When I design, I want it to be timeless,” says Lynn. All the work was done on a strict $30,000 budget. “We built this on a whim and a prayer,” says Dean. The couple stretched the budget by creatively incorporating recycled and salvaged materials. Water-stained sheets of steel, unusable by some standards, were turned into a striking backsplash with intricate, inlaid patterns. The wood flooring was salvaged. Old interior doors became a headboard in the master bedroom, and a friend gave them a set of old doors from a log house, which were hung above a set of twin beds in the guest room. The two also looked to resources on the property to fill in some of the gaps. 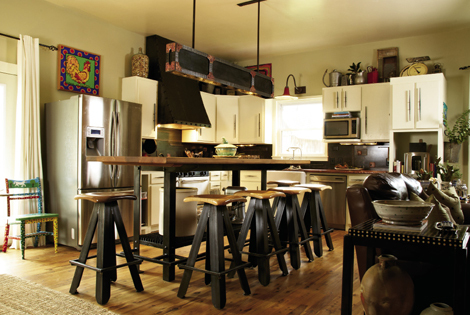 They used wood from red oak trees to form the kitchen island top, which serves double duty as a cutting board. Other trees were used to create bathroom countertops and paneling.